The July issue of NARC. is out from today, available from over 200 outlets across the North East. 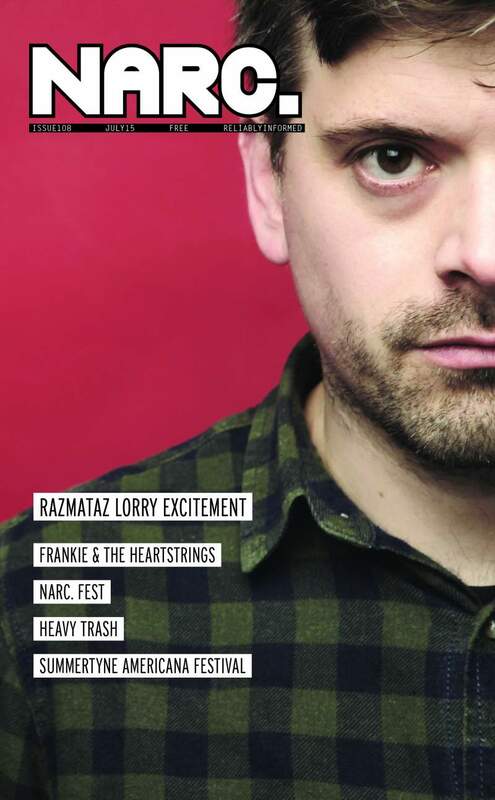 This month’s cover star is one-man electro dance maestro Razmataz Lorry Excitement. Kev Dosdale talks to Eugenie Johnson about subverting expectations of electronica, keeping the album format alive and his DIY ethic. Plus there’s more info on our one-of-a-kind live event at Northern Stage. Top pics by Ian West. Elsewhere, our news section features releases and gigs from across the region, including events featuring Modest Mouse, Foot Hair, Laetitia Sadier Trio, Otis Gibbs, Badly Drawn Boy, Biohazard, Al Lover and more. The Culture pages offer up a plethora of arty wonders. We get to grips with the first ever Sunderland Shorts Film Festival and find out what’s on at Barnard Castle Comedy Festival; documentary collective Amber get a retrospective at Laing Art Gallery and theatre-maker Daniel Bye chats to us about his new projects at Northern Stage. There’s also art exhibitions, theatre performances, comedy shows and film screenings galore! Music-wise, it’s another busy month: Linsey Teggert discovers Apologies’ fluid approach to songwriting on their debut EP; with a rare Newcastle show imminent, Lee Fisher spoke to Heavy Trash’s Matt Verta-Ray about vinyl and artifice; Frankie & The Heartstrings’ Dave Harper and Michael McKnight talk about learning to accept your own mistakes with Eugenie Johnson; Linsey Teggert finds a refreshingly honest pop band in Newcastle quartet Canyons; By Toutatis’ Daniel Cochrane talks to Eugenie Johnson about the challenges of writing and recording with his Teesside-based band while living in Saudi Arabia; Julian Lee talks to new wave rockers The Monochrome Set about prolific songwriting and the pressures of touring after 40 years together; Newcastle quartet Mechanical Mouse Organ chat with Claire Dupree about capturing their live sound on their debut album; Adam Keys talks to New Jersey native PJ Bond ahead of his show in the region; and electro-pop band BITW talk to Eugenie Johnson about their debut EP. Festival season continues, with some top options right on our doorstep. Martin Sharman looks at the highlights on offer at Sage Gateshead’s SummerTyne Americana festival; Joe Fowler offers up his must-see tips for Durham’s BRASS festival and our very own free multi-venue musical extravaganza, NARC. Fest, is back! Peter Slowey from Aquarium Studios shows us what’s in his record collection; there’s demo reviews featuring SoShe, El Cid, Gina Strings, Heartsetonhope and Ali’s Love Child; album reviews of Haiku Salut, Sleaford Mods, Vetiver, C Duncan, Lucy Rose and more, plus singles by Bear’s Den, Cattle & Cane, The Districts and more plus live reports from Du Blonde, Elvis Costello, Sonic Union, Waxahatchee and many more.